I recently revealed my guest room updates, with most of the changes coming from new accessories sewn by me. One of my favorite features of the room is one of the smallest: the new bolster pillows made from the bold checked accent fabric. I love these babies! 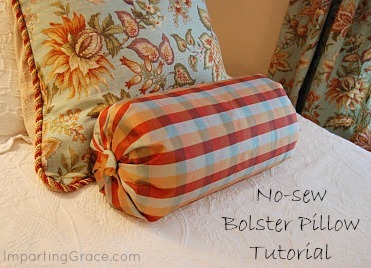 There's a secret behind these bolsters: they're completely NO-sew creations. Here's how I made them. First I cut the fabric to go around my bolster pillow form. Actually, I had an old pillow to recover. I cut a rectangle of fabric 25 inches wide x 29 inches long to go around my form, which measured 15 inches long and 7 inches in diameter. No precise measurements here--just be sure to have a big enough piece of fabric to completely cover the form. Turn under one of the long sides of the fabric and press well. This will end up being your "seam" line on the bottom of the roll, so you want it to be nice and neat. Then I wrapped the fabric around the pillow form so that the wrong side of the fabric was facing out. As you can see, I used backed silk for this pillow, which worked well. I think you could use any medium- to heavy-weight fabric. With the fabric wrapped around the pillow form, secure the two ends as if you were wrapping a piece of candy. I used rubber bands for this. You could use string just as well. Here's what you'll have; I think it looks kind of like a giant Tootsie Roll. Now, turn the cover right-side out. The bunched up ends will disappear inside the cover. Once the cover is right side out, stuff the pillow form back in. Pull the fabric good and taut around the pillow, then use the method of your choice to close the seam. I used my glue gun. You could also use fabric glue or Stitch Witchery. Or if you're good at hand sewing, you could sew the opening closed. My glue gun worked fine. As you can see, I pinned as I went along so that the fabric would stay in place while the glue dried. Tip: Be sure the remove the pins before the glue dries completely--you don't want a straight pin stuck in your pillow! You can leave the pillow like this or add a finishing touch of some kind to the ends. I wanted covered buttons for the ends of mine. You can find covered button kits at any fabric store. The directions are super-easy to follow. You can then sew the buttons onto the ends of the pillow or do what I did and hot-glue them into place. Voila! A beautiful bolster pillow for just a few minutes' effort! That's it! Super-easy, and so pretty in front of the large square pillow! AAHHHHH, very clever. It looks professionally sewn to me! That is adorable! I love that is no sew and so easy to make! Your guest toom is lovely and no - sew . . . perfect. That is stinking AWESOME!! I would have never in a million years thought to do the pinch the ends and then flip it inside out. Brilliant! Thanks for the tip! just where did you learn all these wonderful little tricks?!!! Amazing. You give me inspiration to try one of these myself. Great idea! I love it!!! Absolutely FABULOUS! I will definitely be doing this trick! Thanks for the hint. This? I can do. Thanks for sharing! Richella...this is awesome. I loved your no-sew pillows! You always have such clever ideas girl. Your guest room is lovely. I like that it has twin beds. GENIUS!! You seize to amaze me!! Been praying for your son & hope he is doing better!! 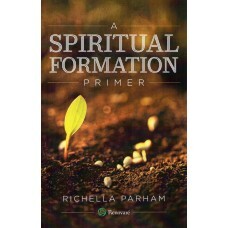 Very clever, Richella! I love bolster pillows and I love how you recovered yours. The addition of the buttons is a nice touch. I love the idea of using an old towel rolled up to make the pillow. The cover looks so simple too! I think I will try this one! Richella, I finally had a chance to look at your new sew pillow & I LOVE it! I'm definitely doing this one with my bolster pillow and I'll link to you. What a great tip and idea! !